Along the outskirts of Ward 7, in Great Kei Municipality, more than 500 toilets scatter the area, a prevailing symbol of the ANC’s failed service delivery. This is another toilets in the veld scandal, just like the R12-million spent on 1,140 toilets in the veld outside Komga, and the R630-million Siyenza toilet scandal. 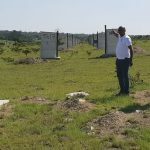 DA Shadow MEC for Human Settlements, Sanele Magaqa, inspects a site on the outskirts of Ward 7, in Great Kei Municipality, where over 500 toilets have been erected, with no houses to accompany them. Everyone seems to be benefitting from toilet contracts, except the community. The Department of Public Works approved a contract to build the lavatories in 2010 with the intention of connecting them to houses that were to be built by the Department of Human Settlements. These homes were intended for residents in the nearby informal settlements and surrounding farms and, while the toilets were erected, nine years later not one house has been built yet. Now the toilets lie in various stages of decay, subject to vandalism. Thieves have stripped many of the toilets of materials, while the remaining structures have become havens for criminal activities. I have submitted parliamentary questions to the MEC of Human Settlements, Babalo Madikizela, demanding to know when these houses will be built and requesting an explanation for the delay of almost a decade. The longer Human Settlements takes to build these houses, the more likely it becomes that they will have to rebuild the toilets. Residents have cried out about the Department ignoring their pleas. The people of Great Kei Municipality are fed up of reporting the issue to an uncaring government. The longer the department takes, the more confusion there will be with regards to the beneficiary list, as people who were initially identified as beneficiaries may have moved or passed away by the time these houses area actually built. The people of this country deserve better than an uncaring ANC government. The DA is committed to speeding up basic service delivery and ensuring that you don’t have toilets without houses, or houses without toilets.